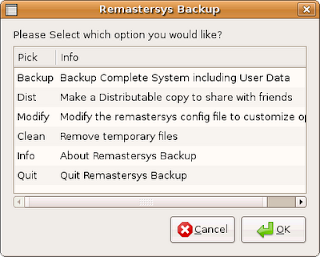 Remastersys is a tool that can be used to make ubuntu livecd and also it can make a full system backup including personal data to a live cd or dvd that you can use anywhere and and it can install at any time. It can make your own distributable copy with all the softwares installed in your system (eg:java,flashplayer, codecs, fonts, mysql, apache, php etc) can share with your friends. This will not have any of your personal user data in it. and how to we get a nice menu like the exact ubuntu cd's / iso files we download? and how do we get that menu we see on the ubuntu live cd/dvd's or iso files we download?